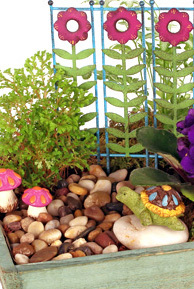 A little fairy garden for little ones to make for Mom! $30 covers hands-on guidance and all materials provided to make an 8" square piece of Fairyland, one per registration. The perfect project to make with Mom or as a gift to surprise Mom! Happens Saturday, May 2nd, starts at 6:00 pm and lasts about an hour and a half. Held at Viviano Flower Shop, 32050 Harper Ave., St. Clair Shores, MI 48082. Please arrive a few minutes early to complete registration (if not already paid in full). A responsible parent or guardian must be present for the entirety of the class to assist each child or group of children and friends in their care. Workshop fee: $30, payable in full; or reserve your place with a $10 deposit and pay the $20 remainder upon arrival. Hold your place with a deposit or full payment 3 ways: 1) here on this Event page, 2) call (800)VIVIANO (848-4266), or 3) visit us. Every garden is unique. There will be many plants and accessories to choose from to customize your design! FAQ: Yes, you're welcome to bring more than one child to work on your garden with you. One garden kit per registration will be provided.